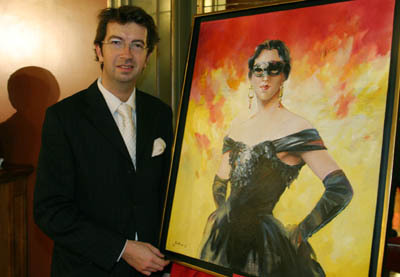 During the years 2002-2003, Gaulthier’s painting changed. Misleading paradox: whereas the features of his flowers became more precise, the features of his women went by, fading away. Because in both sides of Gaulthier’s painting, the depth of the light improved. This is what confers to his flowers this more sensual flesh, these denser perfumes; it is too what gives to his women and their henceforth more evanescent forms, a supplementary presence. It is a play of shadows and sun through a bouquet, the dialogue between the heat and the freshness in a park. It is the fluidity of a droplet on a petal, a half-smile on a face shielded by a parasol. It is Gaulthier’s drawing that changed, not the certainty of his stroke. It is his glance, his discourse - the increasing maturity of this young man who, as every good representational painter, prefers every day more what the work of art suggests than what it could affirms. Doubtlessly also, this evolution is his current form of synthesis between his thirst of perfect and his conviction of the illusion of the beauty. A synthesis or a compromise? - word of bad reputation which designate this intermediate and inevitable place where our new ideas build up themselves, in the crossroad of our contradictions. Then, later, the personal alchemy of mixtures can build itself. Curves, rights, precision, allusion: here are some of the appearent oppositions of Gaulthier, as, more deeply; he must be torn between the desire of a universe that the time does not affect and the consciousness that the flakiness of time irradiates the moment. Of this beautiful and strange combination of flowers and women remains a feeling of an “another place”, a protected space, a refusal, violent in its way, to speak about the fury of the days. Astonishing "off the norm" universe, which seems to want to suspend the course of time and fix the beauty. In this «dreams of stone» dear to Baudelaire, but from which also appears to emerge, lightly, gently impertinent, a derisive smile. Thierry Martin, Director of cultural affairs of the city of Nice. Painter of Breton origin, born in 1971, Gaulthier is exhibited in art galleries since the age of 18 years. Self-taught, at the beginning, J.F. Gaulthier works with pastel. He studies the composition and the colours of the great masters of the 18th and 19th century. Later, proceeding to the oil painting, he keeps this pallet of nuanced shades, this light and this lightness which henceforth belong to him. J.F Gaulthier participates regularly in art exhibitions and was exhibited in galleries in particular in Cannes and Monaco. Settled for 8 years in Nice, he opened in 2003 his studio in the old town. In 2007, he settles down to Saint-Paul-de-Vence. Private Collection Guy Heytens - Monaco. Private Collection: University of the Mediterranean Sea - Nice. - 1987 : Première exposition. - 1988 – 1994 : Expositions d’été (Plérin 22). - 1999 : Beaulieu-sur-Mer (06). - 2000 : Beausoleil – Salon "Aigle de Nice" - Casino de Grasse. 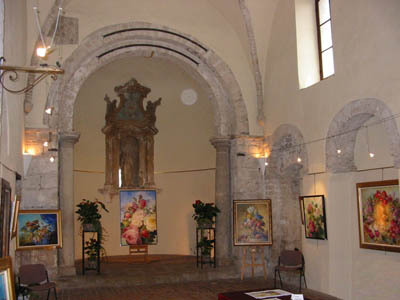 - 2001 : Chapelle de Beaulieu-sur-Mer – Docks Marseille – Salon des Beaux Arts Toulon. - 2002 : Salon MC’Art Monaco – Cassis. - 2003 : Citadelle de Villefranche-sur-Mer - Salon Sporting d’hiver à Monaco. - 2004 : Salon d'Art Contemporain - Bastille-Paris. - 2005 : Bibliothèque Nucéra - Nice. - 2006 : Salon des Bouquets - Monaco. - 1989 – 1992 : Galerie du chapitre - Rennes. 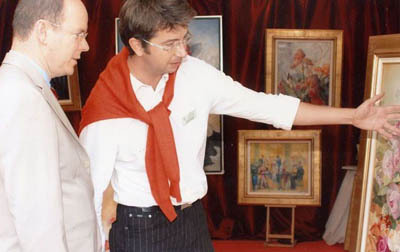 - 1996 – 1998 : Galerie Victoria – Cannes. - 2000 – 2002 : Galerie Guy Heytens – Monaco – Hôtel Negresco – Nice. - 2010 : Juin : 1er Prix "Villa Ephrussi-Rothschild" lors du 3 �me concours de peinture. - 2011 : Mai : Salon des Bouquets de Monaco, dans les jardins du Casino, Salon en l'honneur de la Princesse Charl�ne. - 2011 : Mai : Salon de la Rose, lancement de la rose Fragonard, � la Villa Rothschild, Saint Jean-Cap-Ferrat. - 2011 : Octobre : Salon Regards sur les Arts, Coll�giale de Lamballe. - 2012 : Ouverture de mon Atelier � Saint Paul-de-Vence. - 2015 : Mai: Exposition � l'occasion du 48�me Concours des Bouquets de Monaco. Chapiteau de Fontvieille. - 2015 : Mai: A l'occasion de la visite du Cardinal Poupard � Nice,pr�sident �m�rite du Conseil pontifical pour la culture, j'ai remis la toile" Colombe de Paix" pour Sa Saintet� Le Pape Fran�ois. - 2015 : Ao�t : A l'occasion des 25 ans de la Mostra Mercato de Bienno(Italie), je repr�sente la commune de Saint-Paul-de-Vence. - 2015 : Octobre : Salon Gemlucart, Auditorium RainierIII , Monaco. - 2015 : Octobre : Exposition "La grande bleue" , Centre d'affaires de l'a�roport de Nice. - 2015 : Novembre : La toile "Le cygne" a �t� s�lectionn�e pour participer au sein du Comit� AIAP-UNESCO au Salon ArtBrandeburg de Postdam. - 2016 : Exposition � l'occasion de la 10�me rencontre Monaco/Japon � l'Auditorium Rainier III de Monaco du 12 au 14 F�vrier. - 2016 : Exposition lors de la F�te des Roses, � la Villa Rothschild. - 2016 : Mai 2016 : Salon OASIS � Osaka (Japon), avec le Comit� AIAP-Unesco de Monaco. - 2016 : Cr�ation du 1er Festival "Saint-Paul-se-Danse".Espace Verdet, St-Paul-de-Vence. - 2016 : Participation � l'exposition "La nature de l'art", Maison de France, Monaco. Jusqu'au 16 juillet.